At the outset of the Second World War, when the civilian population of Britain was fifty million, the country imported around fifty-five million tons of food a year. It was one of the principal strategies of the Germans to attack shipping bound for Britain, restricting British industry and potentially starving the nation into submission. 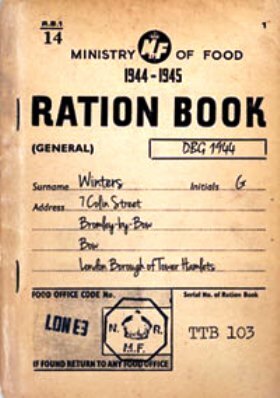 Rationing officially began on 8th January, 1940 and was introduced to ensure a fair distribution of food. Ration books were issued to every person and had to be stamped by a local shopkeeper when the goods were collected. The weekly ration varied from month to month as foods became more or less plentiful. The diet was designed to supply approximately 2,300 calories a day for each adult, with manual labourers and miners receiving extra rations. Babies, pregnant women and sick people were also given additional rations of milk, orange juice and cod liver oil and extra milk was available to invalids. one fresh egg; 50g (2oz) butter; 100g (4oz)margarine; 50g (2oz) tea; 25g (1 oz) cheese; 225g (8oz) sugar; 100g (4oz or 4 rashers) bacon; 3 pints (1800ml) milk, occasionally dropping to 2 pints (1200ml). Meat to the value of 1s 2d (around 6p today) was also included. There was a monthly points system in operation, too, with each person allowed 24 points every four weeks. The more expensive the item, the more points it cost. Cheaper cuts of meat, therefore, became popular and allowed people to save their rationing points for other items such as cereals and tinned food. 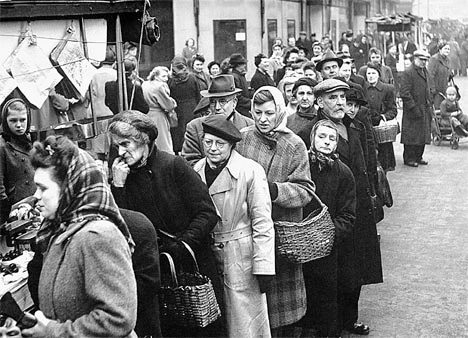 Long queues outside shops became the norm – if there was a long line of people waiting, it meant there was something to buy, though queuing customers had no idea what. (See London Social Life during the Second World War). In 1946, when food was just as short as during the preceding years, bread was added to the ration and the sweet ration was halved. The one food item that wasn’t rationed was vegetables and the population was encouraged to grow their own and their own fruit. 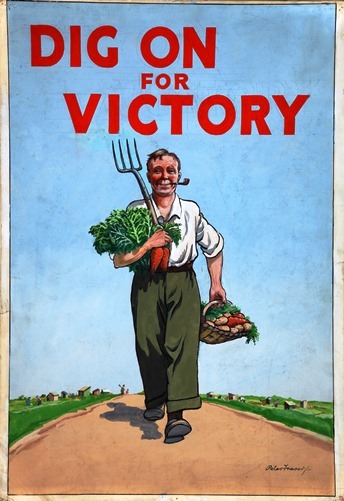 The ‘Dig for Victory’ campaign started in October 1939 and called for every man and woman to keep an allotment. Lawns and flower-beds were turned into vegetable plots. Chickens, rabbits, goats and pigs were reared in town parks and gardens. A huge number of allotments came into being, 30,000 in London alone with 600 of them in the royal parks. The gardens of Kensington Palace were turned over to cabbages. The government made strenuous efforts to keep morale high. For the first time school meals were offered to children, as mothers were working extremely long hours to help the war effort. 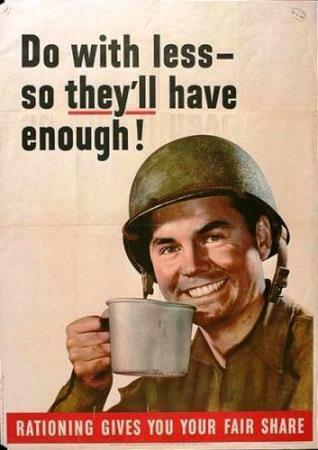 And the Ministry of Food was set up to help families make the most of their rations. It provided recipes and advice, demonstrating, for example, how to use powdered eggs and be creative with what was available. Woolton Pie, named after Lord Woolton, was perhaps the most well-known recipe and went on the menu in March, 1941. 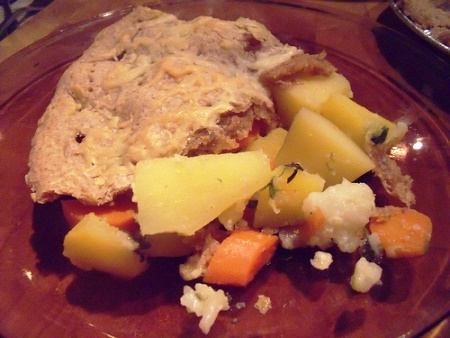 The pie was a mix of stewed swede, turnip and cauliflower beneath a lid of shortcrust pastry or mashed potato. Connie, Daisy’s best friend in The Nurse’s War, is scathing about the food served to the nurses, Woolton Pie being the most hated meal. Restaurants allowed diners to eat off the ration and provided better food than could be bought in shops (luxury foods escaped regulation). For people who were unable to afford such meals, this could be a source of resentment. As a counter, an order came into force in March, 1941, capping the price of a three course restaurant dinner at 5s. 0d. Food was not alone in being rationed. Petrol consumption was severely limited and so, too, was the size of newspapers. At first they were reduced to sixty per cent of their pre-war paper consumption, but by 1945 this had dropped to twenty-five per cent. Wrapping paper for most goods was prohibited. Furniture design became simpler and plainer during the period, while items such as razor blades, baby bottles and frying pans, although not rationed, were almost impossible to buy. Clothing, too, was difficult. Initially each adult was given 66 points for clothing per year but this was cut to 48 in 1942, 36 in 1943 and 24 in 1945. To get some idea how difficult it became, in 1945 an overcoat (wool and fully lined) took 18 coupons; a man’s suit 26–29 and women’s shoes 7. Lace and frills were soon banned from knickers to save on material, and in 1942 austerity measures were introduced to restrict the number of buttons, pockets and pleats on clothes. Second hand clothing avoided points, but their price was fixed. Shoes were in such short supply that in The Nurse’s War, the nurses’ work shoes are kept for years, held together with sticking plaster. Clothes rationing finally ended on 15 March, 1949, but other restrictions remained. Confectionery came off ration in February, 1953 and sugar in September of the same year. But it was not until 4 July, 1954 that meat and all other food rationing disappeared – years after the war had ended.